Here is some fresh stuff from the wild. 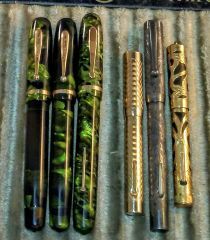 The hand engraved pen is dent and ding free; the big Clipper is like new! The Dusty Rose Duofold has some plating wear, but the other two are rather clean. Nice nice score. 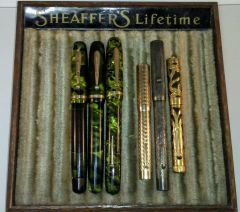 If the engraved sterling Sheaffer is one with which you wish to part, give me yell. I slowly assemble collection of metal Sheaffers.